You are currently browsing the tag archive for the ‘fresno’ tag. Using peppers from my garden. This should have be a very short post about pickling peppers. Chop peppers, add to vinegar, then salt to suit your taste. End of story. This is how I have been pickling peppers all along with excellent results. However I was curious to see how others were doing it. In Google land people were making special brine and canning them, pouring hot liquid over tender peppers [ouch], salting, rinsing and then canning them, one recipe even called for blanching before canning! My pickled Jalapeno from last year is still in great condition, in fact it has even improved with age. I am quite careless with it, it lives in the fridge most of the time though sometimes it is left outside for days on end. Sometimes, bare fingers have fished out peppers when no one is seeing. And yet it has survived. Sigh! I can’t let well alone, even if something works well. I decided to pickle a batch using hot brine method per Google and another batch following my usual recipe. It will be interesting to see how they fare over time. A very important thing to remember before pickling is; sterilize everything that you are going to use in the pickling process. I put the jars and lids in a water bath and let the water come to a boil and simmer for at least ten minutes. I even stick the blade of the knife in the water bath for a few minutes to sterilize it. I also wash the cutting board with the sterilized water and then air dry everything. *In the past I have only used distilled white vinegar for pickling but this time I used raw unpasteurized Apple cider vinegar. Sterilize jars and lids. Remove the jars and lids from the water bath and allow it to air dry in a warm oven. I turn the oven on for a couple of minutes and then turn it off. Meanwhile cut the larger peppers into rings. Remove seeds and discard if you wish. You can leave small peppers whole but they have to be pierced with a fork or slit along the length so the brine gets inside to work its magic. Dissolve the salt in the vinegar. You can add spices or garlic to the vinegar at this time if you wish. I added a garlic scape head from my garden. Pack the peppers in the jar and pour the vinegar over it till it comes almost to the top of the jar. Check to see that the peppers are completely submerged. Any exposed pepper will spoil the whole batch. In fact I keep the jar inverted for a couple of days so the peppers on the top are pickled. The peppers are ready almost immediately though the flavors round off in about a week. I am sure they will last a year as mine have every time, though it is a good idea to store in the fridge. In a non-reactive pan bring everything to a boil except the peppers and simmer for about 10 minutes. 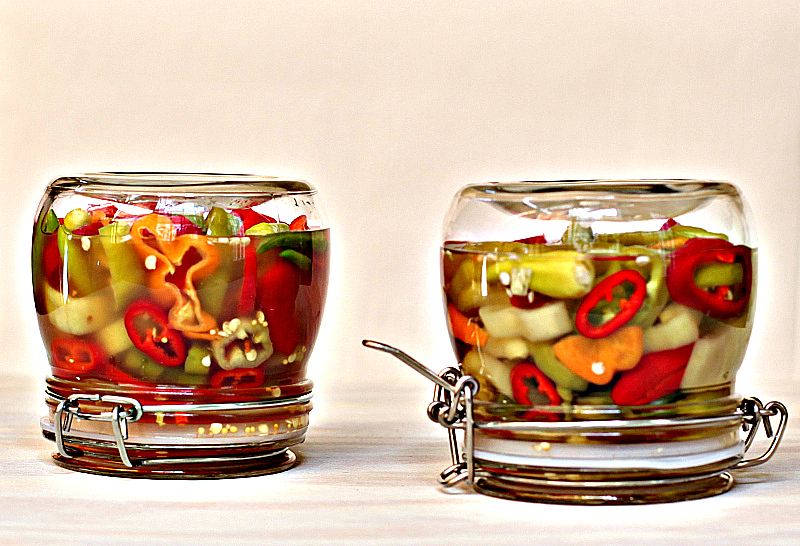 Remove the caning jars out of the sterilizing bath and pack with peppers* right away while the jar is still hot. *See method 1 for instruction on how to prepare the peppers. Pour the hot brine over the peppers. Wipe the rim of the jar and screw the lid on tight. Cool to room temperature and store in the refrigerator. In fact pickles made this way are called refrigerator pickles. They can last up to a year. I used super chilies, habanero, cherry peppers and Thai chilies from my garden. Fresno, cyklon, hinkle hatz and frying peppers from a friend’s garden. Pickling salt or kosher salt is recommended as they are more pure than table salt, which has additives. The pickles will discolor over time. The pickles loose their crunch and tend to get a little soft as they age. 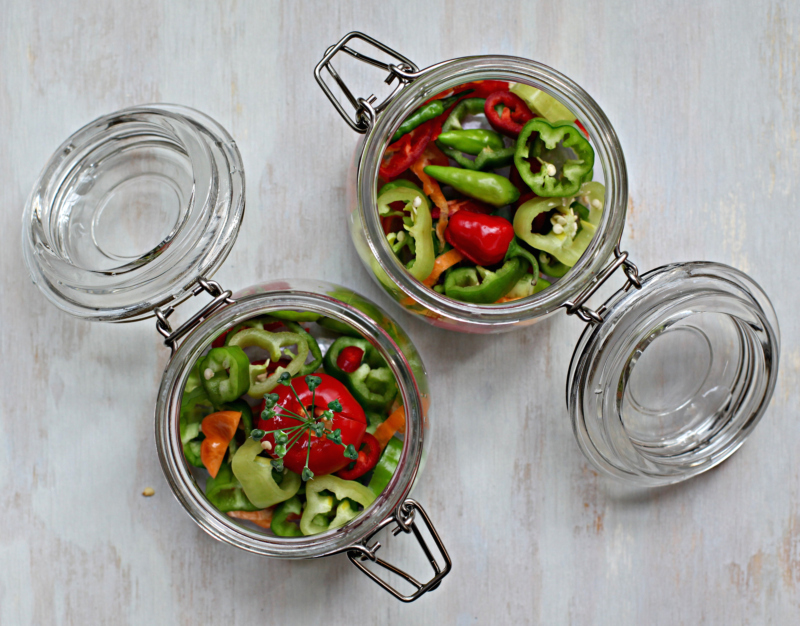 If you want crunchy pickled peppers make small batches to be used in a short time. In my case I had a lot of peppers from my garden which I had to use before winter. 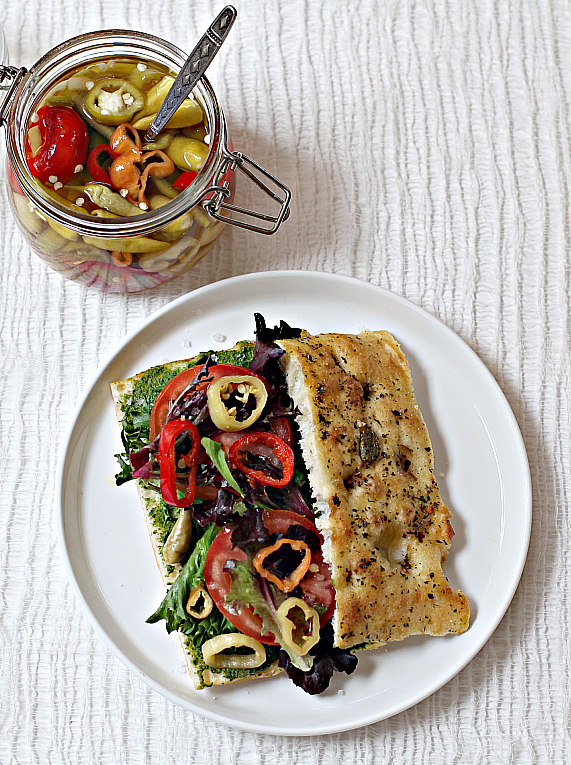 The brine from the jar can be used in interesting ways, in salad dressings, to spike soups and vegetables, on fries, sandwich toppers….